Integrated Services Digital Network (ISDN) provides switched (dialed) digital WAN services in increments of 64 kbps. Before ISDN, the only widely-available method to dial a circuit for data communication between two computers was to use analog modems. When ISDN was created, analog modem speeds typically did not even exceed 9600 bps. The phone companies of the world wanted to have a dialed service that not only allowed faster transmission rates, but also was pervasive as a simple analog line used for voice. Today one could argue that the collective phone companies of the world were ultimately successful with this goal, but not totally successful. ISDN is widely available. It is still a popular technology for dial backup between business sites when a point-to-point or Frame Relay link fails. ISDN was created more than 20 years ago, and it began being widely deployed in the United States by the early 1990s. However, competing technologies, such as DSL and cable, have usurped ISDN in the marketplace for home access to ISPs. However, ISDN remains a popular choice for dial backup. 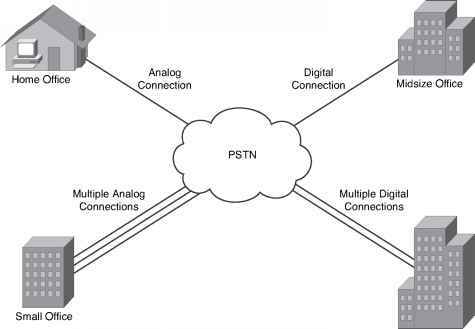 ISDN requires that the two endpoint computers have the ISDN equivalent of an analog modem. There are many variations of these ISDN devices, mainly as a result of the fact that ISDN was created as a worldwide standard, so many options were needed to meet the differing needs of the telcos in different parts of the world. Figure 15-8 shows the required ISDN hardware for a typical connection. Notice that both the home PCs and the router at the ISP use ISDN gear. Routers often use ISDN cards that can be connected directly to the ISDN circuit supplied by the telco. PCs typically use an ISDN device called an ISDN terminal adapter (TA), which often is called an ISDN modem. Because ISDN uses digital signals across the local loop, it does not actually do any modulation or demodulation. However, the term ISDN modem emerged because it was cabled and installed similarly to an external analog modem. So, for the consumer marketplace, the marketing people started calling TAs by the technically wrong but easy-to-understand term ISDN modem. Note that the local loop from the home and the CO now connects to a device called an ISDN switch. Local phone lines typically connect to a voice switch in the CO. ISDN uses digitial signals, so the telco actually must terminate the line from your house in a telco switch that expects digitial signals that conform to ISDN specifications.